A blog entry for today, but no work ! It was a last minute decision, the Doodle was up and several had already registered, but late last night it became clear that we could not work today. 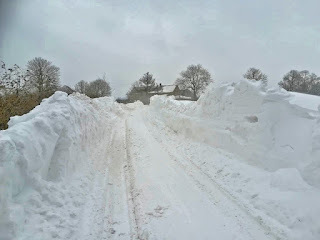 While the volume of snow fallen was not that great, it was the wind and the resulting snowdrifts that did it. Here is a picture taken just 30 miles from Toddington, on the edge of the Golden Valley. Some of the snowdrifts were taller than the cameraman. Some of the gang live as far out as Birmingham and Gloucester, so the decision was based on our inability to see the work site (what chairscrew?) and the low numbers registering, bearing in mind snowdrifts somewhere along their intended route. So today was cancelled. It was the first time ever in Nigel's long career with the GWSR. We're not afraid of snow, but you do have to see what you are doing. 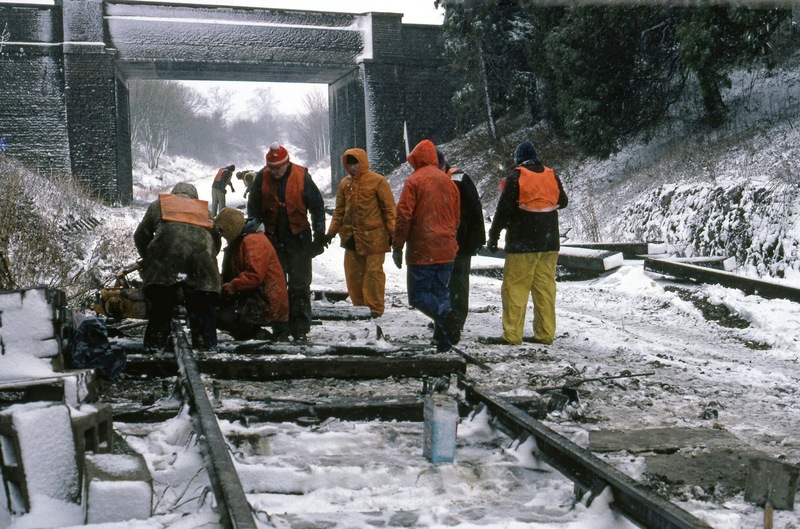 Here are some photographs taken by John Lees in March 1987, exactly the same time of year, but 31 years ago. It must have been cold then, just look at how hunched up they are, leaning into the icy northerly wind as it blows down the cutting at Winchcombe. Our clothing is so much better now. Although... on Wednesday, the day of the snowstorm, a contractor working at Broadway was seen - in shorts ! Must have been a postman, moonlighting. 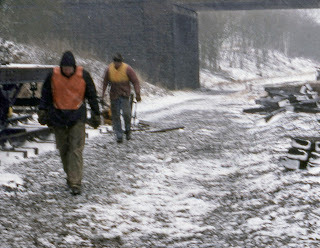 Here the 1987 gang is seen at the southern end of the first track laid into Winchcombe station, prior to opening of course, cutting a rail to length before construction of the loop turnout is started. Later this turnout was moved further south, and then again last year further south still, almost out of sight round the curve in the background. That's the sort of railway we are, getting bigger and more professional all the time. 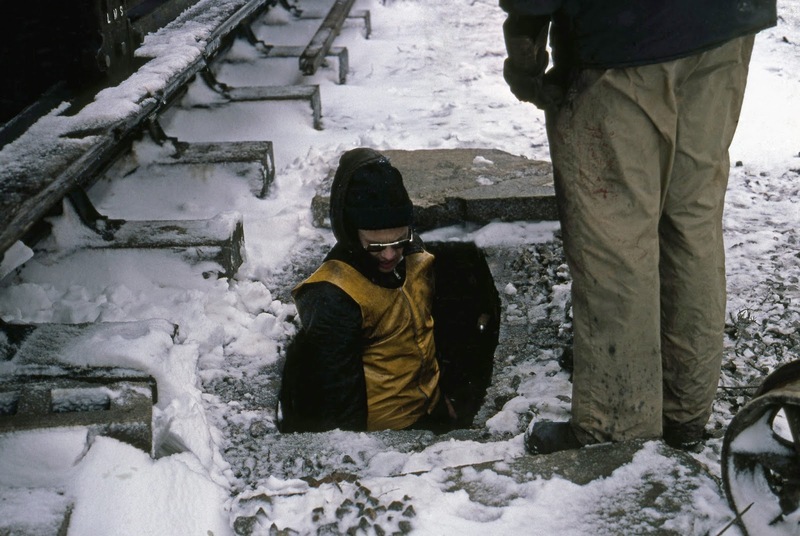 While waiting for the rail saw to do its job, what better use of your time than to climb down into a catch pit to clear out the inevitable rubble down the bottom of it? These pits, built out of a kit of concrete rings, have a sump at the bottom that is exactly as deep as the top of your wellingtons. Stand still, and you are fine, move a muscle, and they fill with icy water. To finish with today, here is a magnificent photograph taken by George Bryant (he of S&T gang fame) on 5th January 1963. The conditions look similar to ours yesterday, with snow wind blown this way and that, clinging to the icy steelwork of the bridge. The loco is 6920 Barningham Hall, bursting out from under Springfield Lane bridge just north of Broadway and heading north with an empty mineral freight train. How do we know all this, from a smudgy number plate? Yes, because here is the same moment captured by fellow photographer Brian Parsons sitting a little higher. George is the figure out in front. The telegraph pole tells us that this was the up side, and Brian noted down the number and date. A moment in time, frozen. Well, thank you very much for the news. No activity at Broadway either. It's very disappointing, but I can't say I'm surprised. So, no trackwork at Toddington, until this lot thaws. That's awkward. Next week ? Who knows. Let's hope it gets milder soon. Meanwhile thanks for all your good work and good luck with the weather. So you guys are human after all, who knew? Had assumed up till now that the Extension team flew into Toddington car park of a Saturday morning and got changed in the telephone box! Having worked for BR, I know the difference between working for Public Service Industry and Heritage one. The former HAS to keep running as, well, the name states it all. But heritage railway does not HAVE to keep going s it is not responsible to the public and therefore thing like safety can take first place over the timetable. Safety both of the stff and public alike. I think the original comment was more in reference to network trains being cancelled rather than the excellent work of the GWSR volunteers. Yes, St.Blazey is absolutely right. And that's how it worked in the old days. Consider the powerful steam locos which would push a huge snow plough into a snow drift in order to keep the line open. I don't need to give examples. Well, just one. 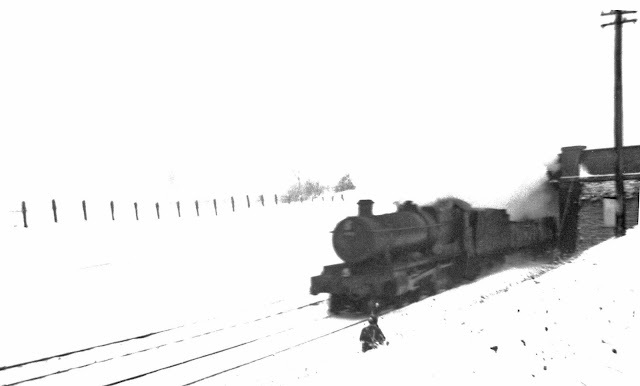 I remember seeing a massive snow plough which was used to keep the line open over Bowes Moor (circa 1300 feet) at Kirkby Stephen on the Stainmore Railway. I don't now if it's still there. Well, this is not the old days, and Network Rail have nothing like that ! They simply cancel services "owing to inclement weather". And they are a national institution ! But the point is taken about heritage railways. In severe conditions, what else can they do ? Well, I've ben looking at various railways' websites on line. And, as I suppose we all know, they all announced "no services" for March 3rd/4th. What else could they do ? Some of them said, "Our station café / buffet will be open as usual, " serving hot drinks, hot meals and snacks." To quote just one example, The Bluebell Railway managed it at Sheffield Park and at East Grinstead. Makes you think, doesn't it ? Network Rail do have all sorts of snow clearing kit - deicing trains, mobile snow melters (basically big hairdryers on a wagon). Some trains such as Class 150 and 158 units and Class 57 locos, have permanently fitted snowploughs. There's also a fleet of massive snowploughs, built on steam locomotive tender underframes. They're the last steam-age vehicles still in service on the national network. I suppose it's possible to argue that there isn't enough of this kit, but genuinely extreme weather conditions are actually quite rare. Those large snowploughs barely turn a wheel from one year's end to the next - there are a couple at Peterborough which I used to see regularly as I passed on trains, and I swear they sat in the same sidings for years on end without ever seeing any use. The big ploughs did get a bit of work over the last week or so, though. Here's a video from March 3 - class 37 snow action! Thank you Michael, for your reply. Sorry, I've only just read it ! Yes, I suppose we all knew about the modern versions of dealing with severe icing, in particular with third rail conductors. Snow blowers, de-icers, hot air driers, vacuum cleaners, and what have you. But your comment has prompted me to have a look on line at what is available in these days. It would appear that the existing snowploughs (e.g. the DRS snowplough which is two Class 37s coupled to an enormous snowplough) are not owned by Network Rail. DRS is a separate company, and rents its services to Network Rail. Of course, they have closed many of the lines which mattered, (notably over Bowes Moor), but I had no idea snowploughs, and I mean snowploughs which could tackle very deep drifts, still existed. Well, that's good news, anyway. The severe winter conditions aren't going away, at any time in the foreseeable future, as far as I can see. When I was a boy scout, the motto was : Be Prepared ! Well, in my opinion, we're not. In this technological age, shouldn't we be ? They seem to cope in continental Europe. Why can't we ? Please excuse an old man being cynical. Countries such as Switzerland have wonderful snow clearance machines, as do Canada and Alaska, but....Look at their annual snowfall records. They find it economical to purchase/fund building these excellent machines. Here in U.K., we don't usually have anything like theirs; and so we don't find it cost effective to purchase similar machines. Thanks for sharing the old photos. Re Peter Wights comment on the Snow Plow at Kirkby Stephen. I cannot recall seeing it the last time I was there. However, I will go around when it stops snowing and have a look. I am only a few minutes away from there. David, well go an have a look if you're nearby, but I doubt you'll find it. I did say it was in the old days ! It was an old NE plough, I think, but I don't know where it was regularly kept. Darlington, or even Newcastle, perhaps. 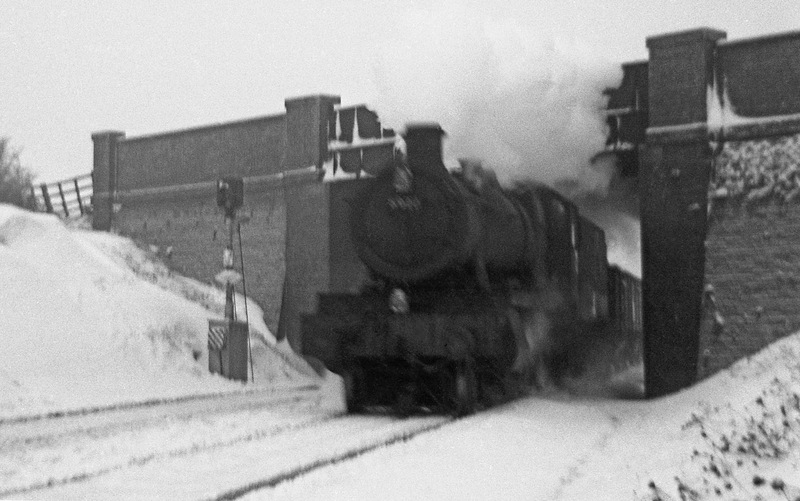 Snowploughs were used right over the summit more or less until the line closed in 1962. 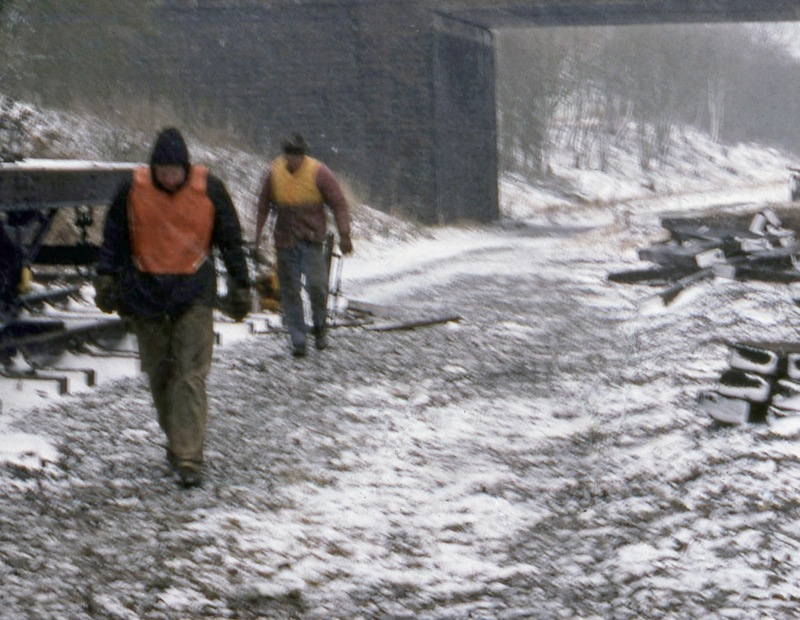 The reopened Stainmore Railway at Kirkby Stephen East would have no need of one nowadays ! Happy hunting, but I think you'll find it's long gone. The Bishop Auckland Plough is beautifully restored and based at NewBridge depot on the NYMR, and Locomotion has the the former Percy main plough in the collections building at Shildon. Thanks, Stuart. Yes, I knew about the snowplough in preservation at Shildon (though I've never seen it), but not about the one based on the NYMR. I wonder if any more still exist. I hope so. The plough I saw at KSE back in the 1950s was as high as the adjacent BR Standard 2-6-0s stationed there at the time. I was told that two locos would push the plough at some speed into deep drifts, a somewhat hazardous procedure for the loco crews, I should imagine. BR "retired" the last plough in use in, I think, 1975. Perhaps it survived. Thanks for the memories, gentlemen. Well, thank you very much to Ian for the twitter from Great Anglia News. The video says it all. Diesel traction, not steam. But these two Class 47s (I think : they went by too quickly for me to be sure) did the job. Admittedly, they were not tackling a deep drift, but they proved the old technology gets the job done ! There were two ploughs kept as shed pets at Bristol Barton Hill until about 4 years ago but I think they were moved on to Taunton ? 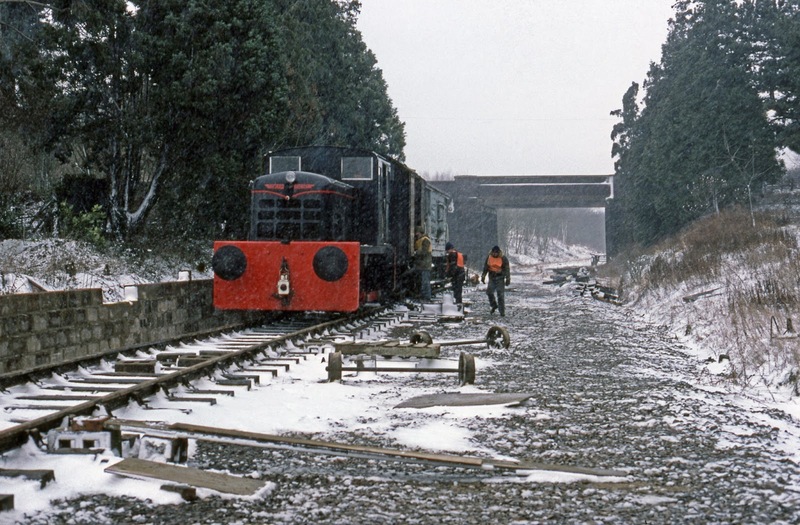 The Snowplough that was at Kirkby Stephen was moved to the Waverley line, however its current location is not known. The excellent video " Snow Drift at Bleath Gill" shows the ploughs in action and from the film it is possible that the KS plough was used. There is a shot of the recovery train crossing Belah viaduct which is betweeh KS and Bleath Gill. The Eden Valley Railway at Warcop has a steel plough which looks in reasonable condition having had a recent repaint I hope this information is of interest. This information is of the greatest interest. The snow drift at Bleath Gill happened in the bitter winter of 1955, I think, and I don't doubt the plough kept at Kirkby Stephen East was used. It was moved to the old Waverley line ? I never knew that ! Well, unless it is now in private ownership, I doubt it has survived. Pity. That's very interesting news about a steel plough at Warcop. You wouldn't think that in the milder conditions of the Eden Valley they would ever need one, would you ? I must take a look when I'm next in the vicinity. I hope you guys have had a good day to catch up on your tasks. If anyone is interested to see how a national rail network is run in winter have a look at this video I came across sometime ago. It was recorded from the cab of an electric loco on the Bergan line in Norway. As it starts off you would not think it was winter but soon gets white as the train starts to climb.